The hunting knife is an ancient tool that has survived essentially unchanged to the present day. Belonging to the generation of tools or weapons after stones and clubs, the hunting knife gave early hunters the ability to butcher animals for meat and skins. It was also important to their defense from predators and warring tribes. The first metal hunting knives were made of bronze around 2000 B.C. , a time generally referred to as the Bronze Age. During 1500 to 1100 B.C. , knives served as patterns for larger swords in Crete and Britain. With the coming of the Iron Age in the period 1000 to 800 B.C. , the use of iron for the manufacture of knives developed. Iron allowed a sharper, more durable cutting edge than bronze. The major problem with iron knives was that they bent easily. The Vikings solved this problem by adding carbon, or "carbonizing" the iron. This hardened the iron blade and improved its rigidity and sharpness. In early American history, one particular design of the hunting knife became a standard by which others were compared. This favorite of the early frontiersmen was the Bowie knife, named after the legendary pioneer James Bowie (1796-1836). This single-edged knife was 10-15 inches (25-38 cm) long. The steel blade was straight for most of its length with a concave tapered point. The modern hunting knife usually has a rigid, single-edged blade with a handle large enough to be grasped firmly. The unsharpened portion of the blade, or tang, extends through the grip area for strength. Folding, lock-back knives and specialized skinning and gutting knives are also used for hunting and dressing game, but the basic, straight hunting knife is the outdoor enthusiast's standard. The most important part of the modern hunting knife, the blade, is made of steel or stainless steel. Of particular importance is the carbon content of the metal, which determines the hardness of the blade. Other substances, such as molybdenum, produce other specific improvements in sharpness, toughness, finish, and corrosion resistance. The guard and pommel may be steel, brass, or aluminum. The stocks, or grips, can be made of many materials. Some knifemakers use exotic woods or animal bone and horn for the stock. Stocks may also be wrapped with leather, or the leather may be in washer-like segments stacked on the tang and contoured to form the entire handle. The materials chosen for the stocks depend greatly on the desired use. More durable, utilitarian materials such as nylon and leather are chosen for knives intended for actual field use, while fancy materials are used for show knives. The most important part of the modern hunting knife, the blade, is made of steel or stainless steel. Of particular importance is the carbon content of the metal, which determines the hardness of the blade. punch press, using a hardened punch and die shaped to match the outline of the blade. The punch is forced through the material into the die, blanking the rough blade into shape. Custom knives may be cut out with a saw, or an industrial laser may be used to cut especially intricate blades. After the blank is cut, holes for the handle stocks are drilled into the tang. Rough shaping is also performed by grinding or machining. This shaping forms the thickness of the blade at various points and reduces the amount of finish grinding on the sharp edge. Any identifying markings or decorative details are stamped while the blade is in a soft condition. 2 The blade is hardened to preserve the sharpness of the knife edge. Each blade material may require different hardening and heat-treating methods; however, common steel blades are generally heat treated in the following manner. 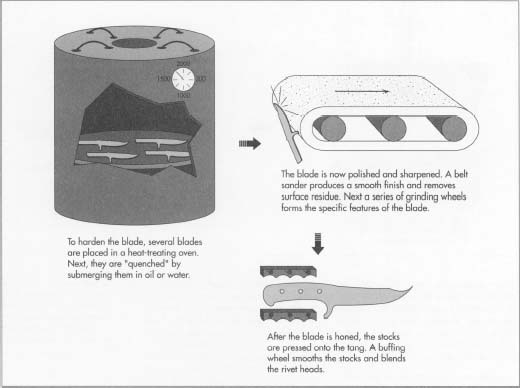 To harden the blade, several blades are placed into a ceramic tray in a heat-treating oven. They are laid flat so the weight of the blades does not cause warping. Depending upon the specific requirements of the alloy, the temperature in the oven is raised to approximately 1600°F (871°C). After heating the blades for approximately two hours, the entire tray is removed from the oven and the blades are submerged in oil or water. This rapidly cools the blades and is called quenching. The quenching locks the metal crystals into an intricate microscopic pattern. This process also results in the metal becoming very brittle. After quenching, the blades are reheated to approximately 500°F (260°C). At this point, the metal has a slight dark-reddish color, and the crystals change their alignment slightly. Then the blades are allowed to cool slowly in a process called tempering. This toughens the metal while retaining some of the brittleness needed for fine sharpening. Further heating and cooling cycles may be used to harden other specialized alloys. to form the edge relief, point, rough edge angle, and other features of the working portion of the blade. When utility knives are made, many of these features are left without further finishing since they are for functional rather than cosmetic purposes. In the case of fancier knives, these features may be hand polished using a rotating buffing wheel and jeweler's rouge. The rouge is a soft, abrasive paste which, when spread onto the cotton buffing wheel and then buffed against the blade surface, polishes the metal to a high luster. When the blade is finished with these steps, it will be quite sharp and may appear ready to use. However, the final sharpening steps are required to produce a long-lasting edge. 4 To the casual observer, the knife edge appears as simply the result of two intersecting surfaces. Upon closer examination, the true form of the edge is seen to consist of two distinctly separate sets of angles. The first is left by the rough grinding as explained above, while the second is the fine angle that actually forms the cutting edge. This edge is produced by a fine grinding operation called honing. The angle of the hone may be between 17 and 30 degrees to the axis of the blade, depending upon the blade application. A smaller angle will produce a sharper edge, but the edge will wear and become dull more quickly. A fine grinding hone, or "stone," is oiled and gently rubbed on the knife edge. This action produces the finest sharpened edge and is the only true method of properly sharpening a knife blade. When viewed under a microscope, the rough ground edge appears as a series of jagged points. is gone. By honing, these points are blended into a consistent edge of equal sharpness. 5 The stocks are riveted or pressed onto the tang of the knife blade. A buffing wheel is used to smooth the stocks and blend the rivet heads. In the case of a leather handle, the washer segments are stacked onto the tang starting at the guard. After the handle length is filled with leather, the pommel is pressed onto the end of the tang and secured with a pin or rivet. This squeezes the leather together, making a tight, easily gripped handle. The leather may be shaped using a grinding wheel and then sealed with a penetrating sealer. The guard and pommel can then be finished by polishing with the buffing wheel. Great care must be taken during the assembly and finishing process as not to damage the knife blade or ruin the sharp edge. To insure a sharp edge and long life after sharpening, the heat treatment of the blade must be monitored. This is performed by measuring the Rockwell Hardness, a procedure in which the blade or a sample specimen is placed under a hardened point. A heavy weight is exerted upon the point, and the amount of penetration is measured. The dent left by this test is barely visible to the naked eye, and can be done under the handle where it will be hidden. Using various conversion scales, the hardness can then be compared with the desired standard. Sharpness and finish of the blade are also important. Skilled technicians visually inspect the blade, including using a microscope to closely view the sharpened edge. Any defective blades are returned to the final finishing and honing operation for rework. The finish of the handle and other portions of the knife are also visually inspected. In particular, show knives are meticulously examined for the slightest defect. Since these knives are a form of art, they will be closely scrutinized by the buyer; any visual defects would lessen the knife's value. Also, if the knife is a duplicate of an historical piece, specific design details and markings are important to the collector. The design and construction of the hunting knife has changed little in the last 200 years, and little change is expected in the future. Advances in metallurgy will continue to offer knife manufacturers new steel alloys, which they will use to improve the hardness, durability, and finish of their product. Likewise, new plastics with improved impact resistance, formability, and surface finish will find applications as knife stocks, or grips. These will be minor changes, though, and will not change the overall design. Today's hunting knife will continue to be a useful and valued tool for the outdoor enthusiast, and will be kept proudly to be handed down to future generations. Boye, David. Step-by-Step Knifemaking: You Can Do It! Rodale Press, 1977. Latham, Sid. Knifecraft: A Comprehensive Step-by-Step Guide to the Art of Knifemaking. Stackpole Books, 1978. Peterson, Harold L. American Knives: The First History and Collectors' Guide. Scribner, 1980.
Cooper, D. "Points of Interest," Popular Mechanics, October 1993, pp. 65-69. I have a 1600-1700 metal knive belive to be a french traders knive that was found in Northern Alabama on a old Indiana trading post. Would like to have it apraised. Can tex pictures.